Kaabah is a heaven on the Earth beyond any explanation. Not a single word can describe the experience and feelings that one goes through after seeing it. It is the most sacred and perfect site in Islam is also known as Bait Ullah. The House of Allah –this mere concept is enough for every believer to feel an indescribable attraction and satisfaction while only imagining the Kaabah. The feelings attached to Kaaba, the peace and serenity and the ultimate satisfaction is tremendous. You can’t get this exclusivity at any other place on the Earth. There is not a single site on the Earth, which as central, as holy to people or as ventured as Holy Kaabah. This place in the Saudi Arabia is the most celebrated site of the world. Millions of people encircle the sacred Holy Kaabah at Masjid al Haram 24 hours a day, which is a unique trait of this place, billions of houses are adorned with its pictures, and more than trillion people face it daily at five times. Indeed the Holy Kaabah is the epicenter of Makkah. It is the nucleus of the Muslim world where circumambulation of Kaabah never stops. The believers yearn to see the precious site of this Holy House of Allah SWT and spend their lives collecting money to reach here. The cubic-shaped building is in the heart of every Muslim. It is situated in the center of the most popular estate of Mankind. Standing tall and shrouded in black, this place has a fair share of secrecy and mystery. The Black Stone which is positioned at the corner of this sacred site came directly from the heaven. It was fixed here in the life of our beloved Prophet Muhammad PBUH when he averted a major bloodshed by suggesting placing it using a cloth so that every tribe can lift it up. The Zamzam well which is yet another miraculous entity situated around Kaaba. It has been thousands of years since the gushing of its water started, but the water does not dry up. Drinking this water is Sunnah, and one gets reward over simply drinking it. Not only this, the water has healing powers in it and has cured hundreds of illness. What a blessed place! The duas get accepted in Masjid Al Haraam specifically near Holy Kaabah. The Maqam e Ibrahim close to Kaaba is another place where supplications are heard and the Zamzam well is also among those most sacred of places where supplications get accepted. 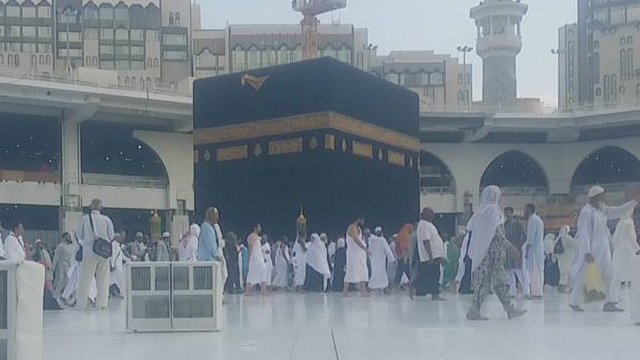 Imam Abu Hanifa states that the first sight of Holy Kaabah is the time when duas are accepted. The above mentioned proves that the House of Allah is the surely a heaven on earth as it surely has connections with the heavens on the skies. May Allah give every believer soul on this Earth an opportunity to visit Kaabah and help us to stay at the righteous path, Ameen. Dawn Travels is one of the top Hajj Umrah Travel Company in the United State of America.